Default and distress scenarios have assumed major proportions in both the experiences and the anxieties of aircraft owners, financiers and operators. The current state of the aviation market is leading to an increase in defaults, workouts and repossessions. In addition, a default event may occur for many other reasons than the obvious non-payment of lease rentals or lapses in insurance, licences, authorizations or registrations. A third party may claim an unexpected lien; unanticipated navigation charges may suddenly appear; a plane may become inadvertently involved in a fleet detention; interpretations of documentation may differ among jurisdictions—the possibilities are literally endless. No contract or repossession insurance policy can list all the contingencies. Fees, time periods, costs of all kinds, remedies, immunities, required documentation, recognition of foreign judgments, interim measures—all these and many other crucial considerations are fully explained for each jurisdiction. 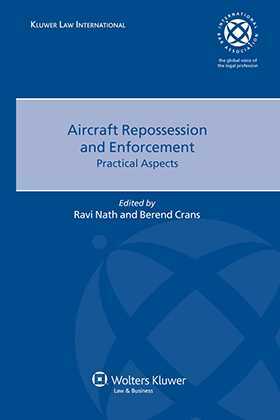 Loaded with precise, up-to-date information and expert practical guidance, this book will be of enormous value to aviation lawyers, counsel for aircraft owners and operators, receivers, export credit agencies, banks, lessors and investors with interest in the aviation industry. 3. Australia; I. Wallace, C. Forster. 5. Brazil; R. Lynch, A. L. Derenusson. 7. Chile; J. M. Bambach S, Claudio Campos B. 9. Denmark; M. Lundqvist Jakobsen, M. Christensen. 10. Finland; H. Hedman, K. Kultakuusi. 17. The Netherlands; B.J.H. Crans, R. Polak, M.-J. Blaak. 18. Nigeria; L. Fubara Anga. 19. Pakistan; K. N. Kabraji, S. Mumtaz. 21. Portugal; C. da Sousa e Brito. 23. Singapore; Lok Vi Ming, G. Asokan, M. Seah, J. Lim. 24. South Korea; Young Kyun Cho. 25. Spain: Tomàs Fernandez-Quiros, Julio Lopez Quiroga. 26. Sri Lanka; Lasantha Hettiarachchchi. 27. Sweden; J. Dernestan, A. Zettergren, H. Riese, C. Grunditz. 28. Switzerland; P. Hünerwadel, T. Luginbühl. 29. Thailand; F. Evans, Pajaree Thongvanit, Kanidha Devakul. 30. United Kingdom; P. Farrell. 31. United States; E. K. Gross, D. N. Gerber, M. J. Edelman. 32. Venezuela; J. Pate, G. Sosa, T. J. Pate.